Home Costs > How Much Does Flashing a Chimney Cost? How Much Does Flashing a Chimney Cost? 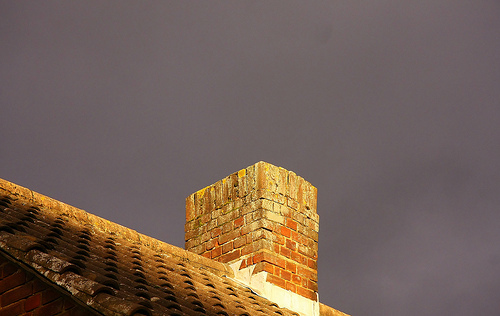 Flashing a chimney is a waterproofing procedure where thin continuous pieces of sheet metal are installed to prevent water from getting into the chimney, and one of the most common places for a leak to occur will be around the chimney. Even if the chimney has been flashed in the past, it doesn’t mean it will last forever, and that is why it’s so important to have a chimney inspection annualy to make sure the flashing is in tip-top shape. How much does it cost to replace chimney flashing? On average, flashing a chimney can cost anywhere from $250 to $1,000. This price really is going to depend on the type of chimney you have, the flashing you have, the type of flashing you and the contractor you hire. The type of flashing you choose can also affect the price. For instance, galvanized steel and aluminum will be the most standard choices and will be near the lower end of the price range, but if you were to choose a higher quality material such as copper, then it could be 40 to 50 percent more. If you were to have a metal chimney with a stainless steel flue duct inside, then the costs can be around $300 to $600 to flash the outside of the chimney where it penetrates the roof. Now if the chimney is made of brick and the existing flashing has to be replaced, then the costs can be in the $500 to $1,500 range, depending on the sides. For instance, if you have a large multi-flue chimney the needs flashing down the sides, the costs could easily be close to $1,000. The cheapest option, which is usually done if you’re getting your roof replaced, can cost as little as $150 to $250. According to one commenter on Angie’s List, he said he would expect most flashing jobs to be within the $250 to $400 range if it’s a base flashing job. Baumgardt Home Inspections, located in Wisconsin, said the average chimney flashing job could be in the $200 to $500 range, depending on the type of chimney you have. For example, a sloped asphalt could cost $200 to $400, while a flat built-up could be in the $300 to $500 range. Most contractors will first clean the chimney of any existing flashing, and the deck built around the chimney will be inspected for any sort of damage such as wood rot. If any of these problems are present, the issue will be resolved and a small peak, referred to as a cricket, will be built on the back of the chimney if it’s positioned in the center of the roof. This will be done to prevent water from hitting the chimney directly. The next step involves grinding the mortar joints to secure the new counter flashing to the chimney. It will then be wrapped with a water barrier, followed by step flashing the shingles around the sides and back of the chimney. Lastly, the counter flashing will be installed and all of the joints will be re-mortared. Customized flashing material that matches up to the exact material on the roof can cost more. Many contractors will just carry a standard material that can closely match what is already there. This process is often done with a chimney sweep, but sometimes, the contractor may not include this service in their initial quote. If you’re having the flashing done due to moisture damage inside the home, the contractor may find serious structural damage if you waited too long. As this moisture enters through the roofing material and into the attic, it can cause roof damage, wood rot and/or drywall damage, all of which could be an additional cost to consider. One of the main reasons that a chimney flash goes bad is due to the installation in the first place. It is crucial that a professional is hired so that more damage is not caused in the future. There are many contractors out there that do not know what they are doing. To save money, you can ask your insurance provider if they can cover the cost completely or partially depending on the coverage the insurance provider gives. Many homeowner’s insurance policies can cover damage that has been done because of storms, etc. Look for contractors that can install a metal that will last longer such as stainless steel or copper. You will be able to save money in the long run by doing this even though the upfront costs may be more. If you do want to hire a professional, consider getting multiple quotes from HomeAdvisor.com for free. Simply describe your job and contractors will contact you with ballpark estimates for free. This can be a DIY job if you want to do the job on your own. The Family Handyman says materials should cost about $20 to $100 and most people can finish within the day; however, the job is marked as a “complex” job, so proceed at your own risk. To make the process easier, chimney flashing kits are available online for less than $100.